Home / Reviews / Men / Do you exfoliate your whole body? You should be. Do you exfoliate your whole body? You should be. Do you exfoliate the skin on your whole body? There are so many benefits to your skin when you do whole body and facial exfoliation. The first and probably the one you will notice the most is that it brightens your complexion, sometimes you don’t know what it is about your skin that you don’t like, but I think you will find that your skin is dull. Exfoliation can make a huge difference. I was so blessed to be able to review a new exfoliating mitt by Joyaplenty. I am so overjoyed with this product. I simply soaked for a bit in the tub and rubbed this on my skin. Amazing results for me, skin was rolling off in a crazy way, I never realized that I should be doing this. This is good for your health in general too, it detoxifies your skin, kills bacteria and prevents breakouts. One of the things that I was surprised to learn was that it can reduce or eliminate ingrown hairs. As you exfoliate with this mitt you can feel your pores being cleaned and cleared out. Most people do exfoliate their skin on their face but, and when they do this they are usually using a product with microbeads. This microbeads are slipping through most water treatment plants and are ending up in our lakes, and oceans, and causing some major problems. You can still get excellent exfoliation with the Joyaplenty mitt and not have to worry about the microbeads. Exfoliation can reduce fine lines and sun damage, improve skin tone, get rid of dead and dull skin cells and the best part, it can reveal healthy, younger looking skin. Everyone who is under 30 thinks that they only have to worry about their face, but as a 40 something, I can tell you the skin on your whole body needs to be treated well. I have noticed that it even fades stretch marks and removes those little tiny dry bumps. This is really a gentle mitt that does not hurt or scratch your skin. This mitt is made out of cocoon silk and it just seems to work so well in collecting the dead skin cells and moving them on out. I love that the products that I put on my skin after exfoliation seem to penetrate well and the results seem to last longer. If I use a moisturizer after a bath of exfoliation my skin holds that moisture so much better than without it. Use this mitt 2 times a week or so and just wait for the fantastic results you will see in your skin all over. The Joyaplenty Mitt Purchase has a Good Karma Policy, which means you will LOVE it or you will get your money back, PLUS 10% net profits to USA children’s Shelters. I think that gives you are pretty great idea of how much they believe in this mitt. You can buy your own mitt at Amazon at the Joyaplenty Mitt link. 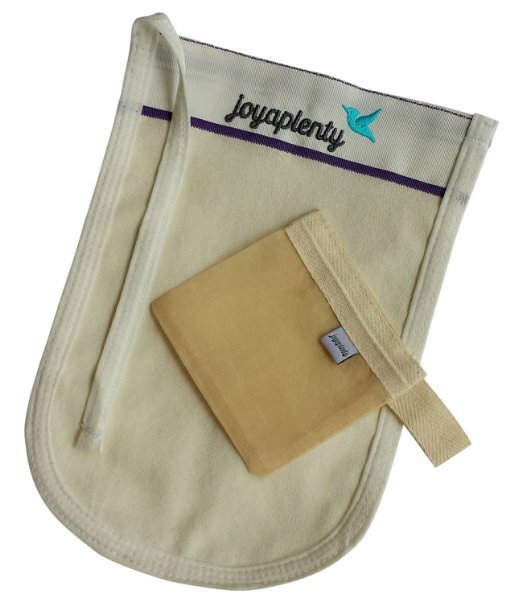 Joyaplenty is offering the body mitt along with a bonus facial mitt for just a short time and when they are gone, they will only be sold separately, you can purchase them here on Amazon! As Joyaplenty continues to introduce new products you can be notified first and get discount codes if you subscribe to their newsletter. We are also going to be having a giveaway that starts on Sept. 4 right here at Tales From A Southern Mom.